Is that weird to say coming from a vegetarian?? It’s all due to the taro root. If you think it’s like a potato, forget it. Taro is so much more flavorful. Just make sure you buy the big root, not the little fuzzy ones. The little ones are good too for boiling, peeling, and dipping in sugar, but for soup, you need the thick purple streaked taro root with leathery skin. It usually comes chopped into hefty rounds, about 5 inches wide in diameter, the inside visible. I had some oregano and thyme from the garden that I microwave-dried earlier in the fall, so I added a sprig of each along with a few bay leaves and a fistful of corn to sweeten the broth. Plus scallions at the very end to add just a touch of freshness. You can simmer this just until the taro is cooked or for longer, so the taro breaks down, turning the broth opaque and starchy. I like it somewhere in between, the taro very soft but still chunky, the broth creamy yet still soupy, and the scallions barely wilted. 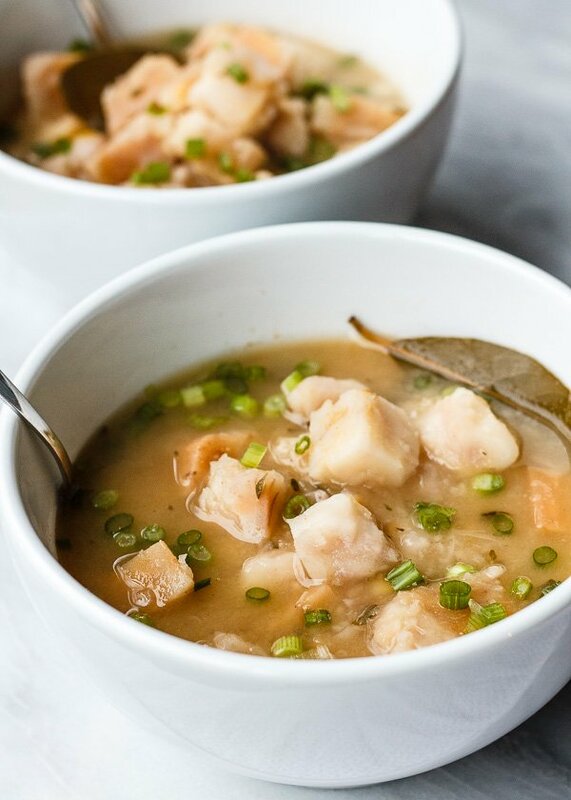 For meat eaters, you can also make this with bone broth or spare ribs. 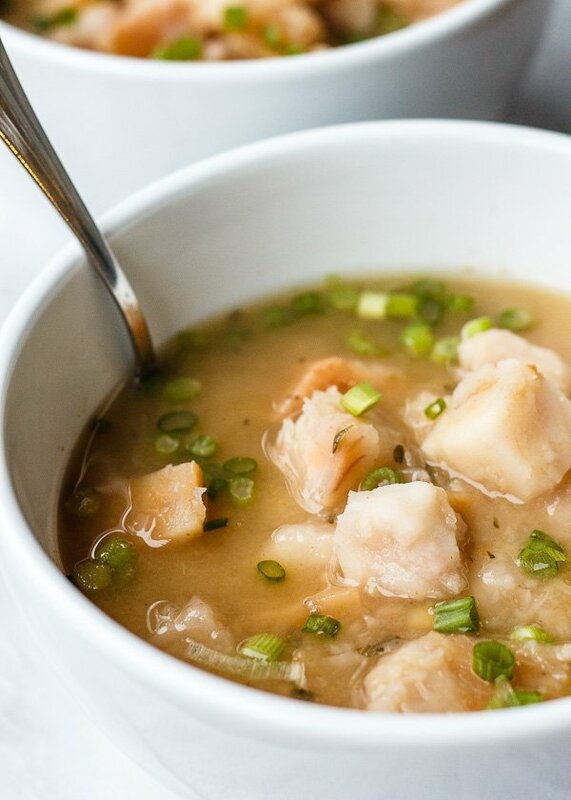 If you can get a good marrow bone from your butcher, crack it with a hammer, simmer it in a big pot of water until very brothy, add 1/4 teaspoon rice vinegar (helps you absorb the calcium from the marrow), then add the taro, it’ll be tremendous. 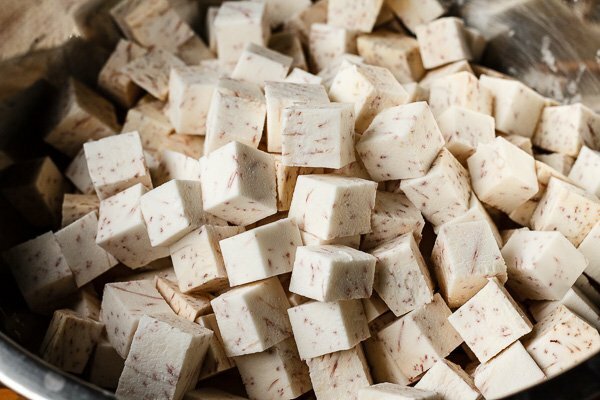 Cut the bark/peel off the taro, then dice it into 1 inch cubes. 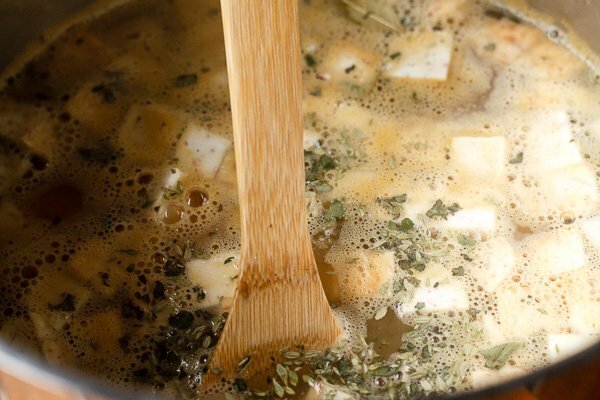 Bring 3 cups of vegetable broth and 3 cups of water to a boil in a large pot. You can use all broth but I found mine to be fairly thick, so I thinned it out because the taro starch will thicken the soup even more. Add the taro, herbs, and corn kernels (if using) to the pot. You don't need to wait until it reaches a full boil, but once it does, turn the heat down to low and simmer for 20-30 minutes. 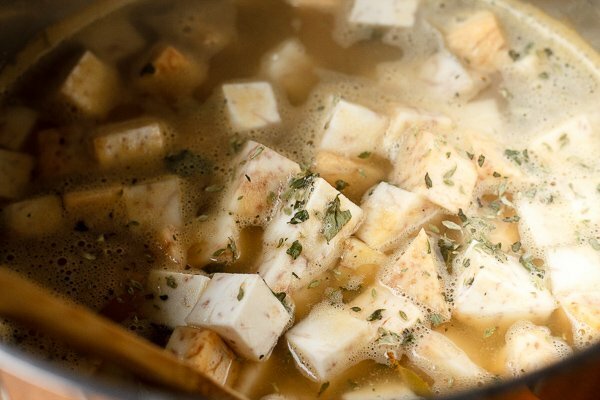 The taro should be fully submerged at all times, so you might need to add another cup or two of broth/water. 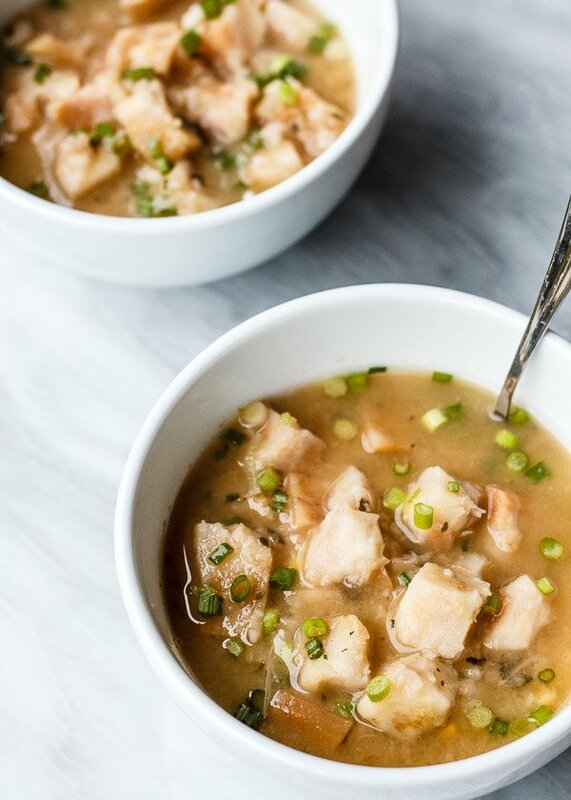 Stir the pot once or twice during the cooking process because the taro at the bottom of the pot will cook faster, so you'll want to bring those to the surface and let the top layer sink to the bottom. Add salt to taste when the taro is tender to your liking. I prefer it on the 30 minute side. Turn the heat off and stir in the scallions. Cover the pot for a minute just to let the scallions gently wilt. Serve steaming hot. Hmm.. I love taro chips and I’ve tried deep fried taro, but I’ve never had it in soup! 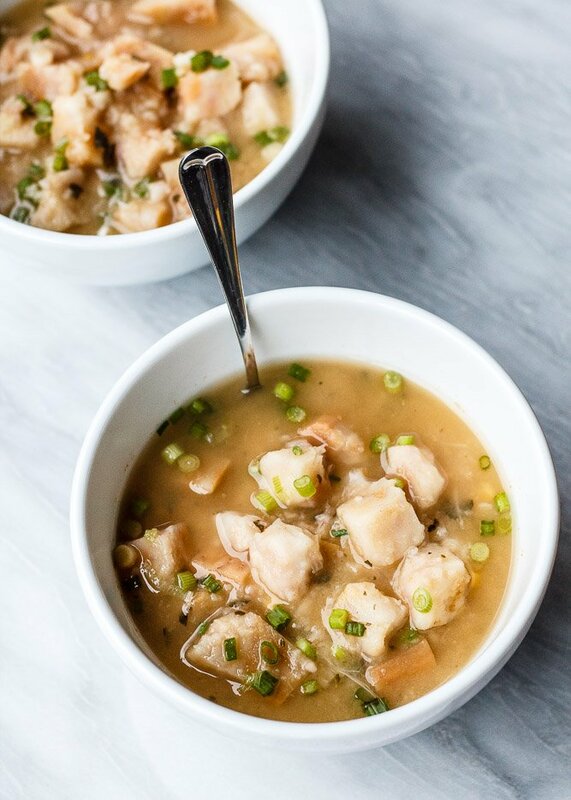 It looks so much like an Asian soup, but the ingredients aren’t specially Asian, right? Sounds and looks so delicious, Lu! This soup looks super delicious. I’ve never had taro, have to try! Hi Nicole! I hope you try it – I love the texture and taste – so unique and comforting. Taro chips and taro fries are good too!